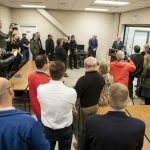 OTC officials and industry partners celebrated the grand opening of the MHC Diesel Technician Training Center today, Jan. 28 at the OTC Springfield Campus. The capital project was made possible through a $1 million matching grant from the Economic Development Administration of the U.S. Department of Commerce. The additional $1 million was raised primarily through numerous private donors, including the center’s naming sponsor Murphy-Hoffman Company (MHC). 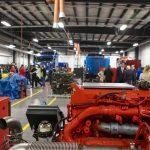 The MHC Diesel Technician Training Center is an addition to the college’s original diesel training facility located in the Industry and Transportation Technology Center (ITTC). The new facility is situated on the east side of the building near National Avenue. Students in the diesel technology program can earn either a one-year certificate or a two-year associate degree. Currently, the college graduates about 35 students from the program each year. With the additional learning space complete, OTC officials hope to double that number. 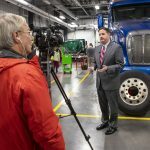 “The trucking industry has grown immensely since the company was founded, and it is a large component of the local economy. 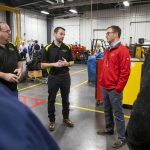 Offering state-of-the-art technical education at OTC will keep well-trained employees in the area and the economy healthy,” said Kyle Hoffman, MHC vice president and general manager. In addition to MHC, SRC Holdings Corp., Commerce Bank, The Larson Group – Peterbilt and the Sunderland Foundation all donated to the project. Total cost for the 12,500 square foot project was $2 million. 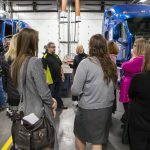 The MHC Diesel Technician Training Center opened for classes in January 2019 with more than 100 student enrolled.